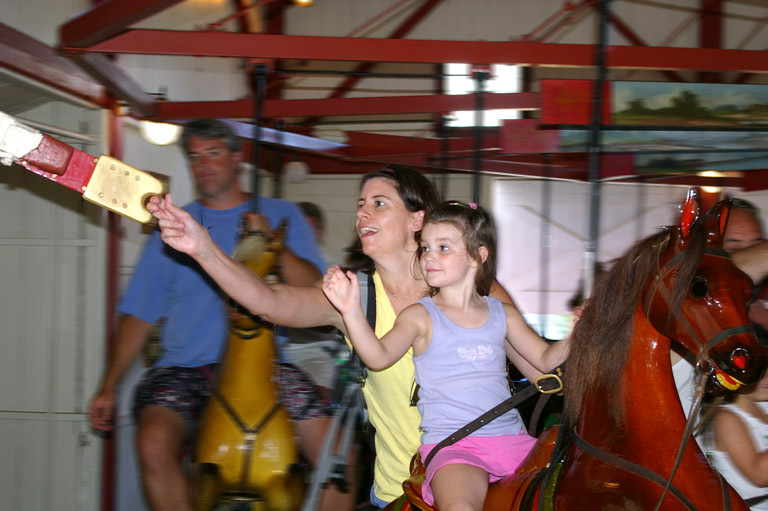 My friend asked me to photograph her and her daughter riding the "Flying Horses" carousel on Martha's Vineyard (the oldest carousel in the U.S., built in 1876). In the original photo ALL the people and horses on the carousel were in sharp focus, not just my friend and her daughter. I used Photoshop Elements 5.0 to create a duplicate layer, added motion blur to the top layer (angle 0 degrees, distance 35 pixels) then used a soft round eraser tool to erase over my friend, her daughter, their horse, and the brass ring holder, showing them in the focused layer underneath. Very good end-result ! I guess she is happy with this photo. Good explanation too in the note. Good colors and clearness, good sharpness.